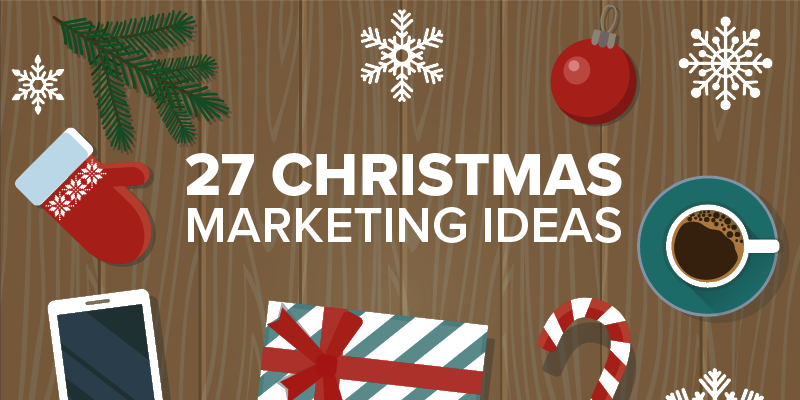 Regardless of what your preferred marketing channel is, we have put together a list of 27 Christmas marketing ideas you can use to add some sparkle to your holiday marketing and sales strategy. There is still enough time to implement many of these ahead of this Christmas, and for those that require a little more planning, you have around 52 weeks left to finalise them for next Christmas. As we approach Christmas each year, there are a few things we can count on: Christmas decor will seem to go up earlier than the year before, a once popular musician will release a Christmas themed album, and there’ll be a new Doctor Who Christmas special. And once the season is over, there will be multiple reports examining the performance of retailers and products, and even changes in customer behaviour. More recently these reports have started to include analysis of online sales, including purchases made using a mobile device. Although these reports are sometimes a little heavy on the superlatives and hyperbole, they do offer valuable insights into how any business can benefit from the ways in which technology are influencing customer behaviour. For one, small businesses were limited to operating and marketing within a small radius of their geographical location, making it difficult to grow and effectively compete with larger businesses. The internet has changed this, first slowly, but much more rapidly in the last decade; with e-commerce platforms, email marketing and mobile apps becoming more accessible to small businesses. It is important for small businesses to embrace these changes, and to take advantage of the benefits they bring throughout the year, but especially over the Christmas period. Businesses began taking advantage of the commercial aspects of Christmas in the late 19th Century, first marketing their Christmas wares through their store fronts, then in print, radio and television ads. Available marketing opportunities have since grown to include online advertising, e-commerce stores, and much more recently, mobile apps. Which isn’t to suggest you should be using all of these marketing avenues, but rather those that are most frequently used by your specific audience in addition to considering online and mobile. Why online and mobile? As noted earlier, small businesses were previously limited to operating and marketing within a small radius of their geographical location, but even with the addition of online and social media advertising, their pool of potential customers is still restricted to those who live, or pass close-by. Moving into online sales via an e-commerce site or mobile app removes those restrictions, with the only impediment to significant sales growth being how discoverable they are online, and the number of territories they ship to. 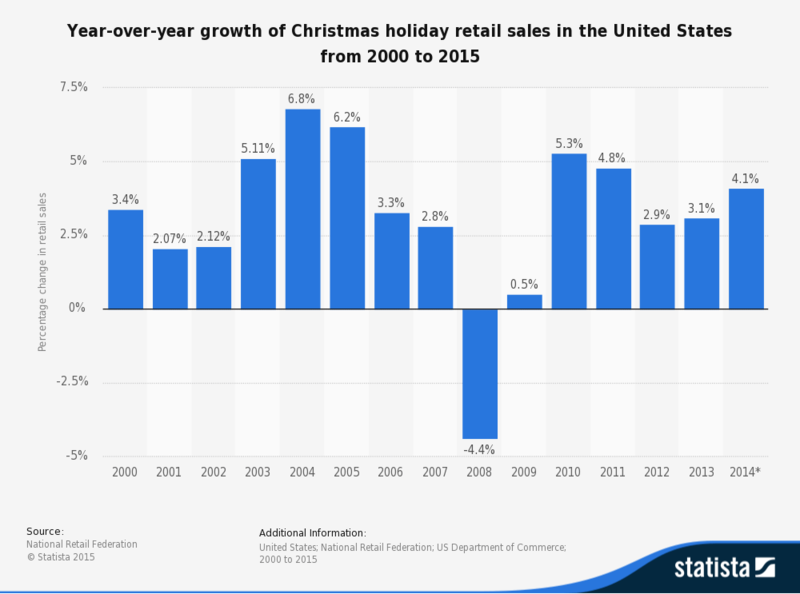 Thirteen of the last fifteen Christmas seasons in the US have seen sales growth of 2-6% over the previous year, with the only dips following the 2008 recession. In the UK, retail sales grow by 30% during Christmas, with 14% of all Christmas sales happening online – up from only 9% in 2011. Online sales in the UK are projected to grow by £22B over the next 3-years, with 43% of those sales taking place on a mobile device. 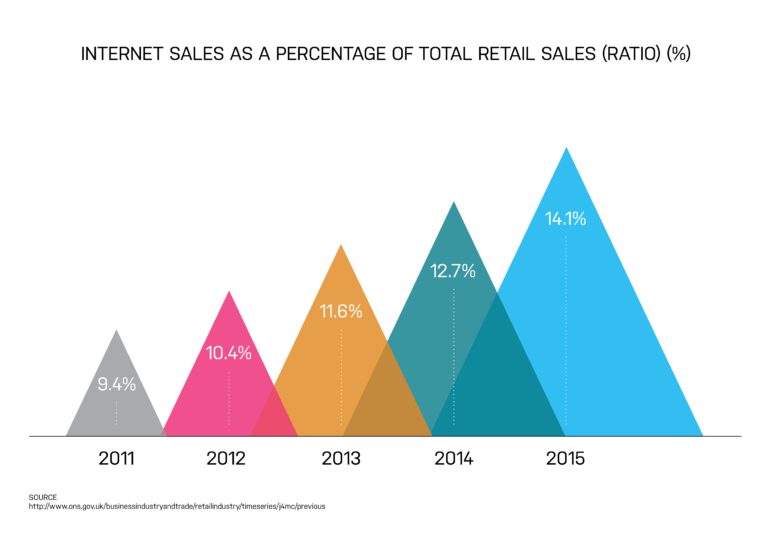 UK Online sales projected to grow by £22B in next 3-yrs, with 43% of those sales on a mobile. And before you discount these as mere projections, you should note that smartphone sales made up 54% of online sales from mobile devices in December 2016. Smartphone sales made up 54% of online sales from mobile devices in December 2016. 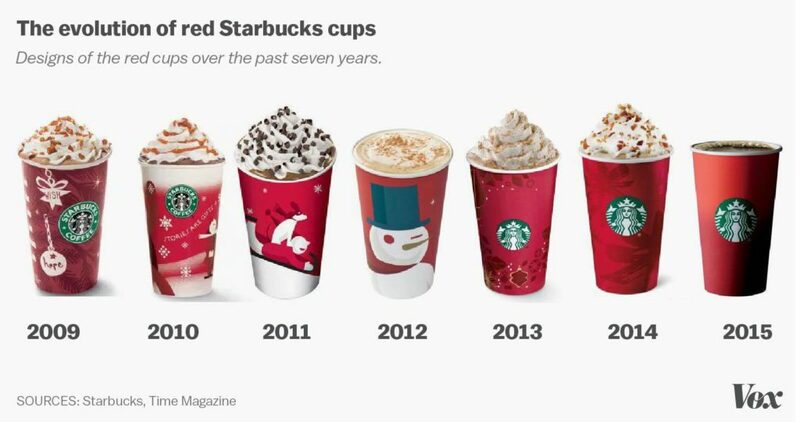 Something that almost any business can do is to update all branding with a bit of festive flair. Adjust your logo and social media profile pictures to incorporate elements associated with Christmas and use it throughout the season, both online and in any printed media; but make sure it doesn’t negatively influence brand recognition. Any costs associated with this can be justified by the fact that you can reuse these images for several years. You can also add Christmas flair to your social media header images, either as a single Christmas-themed image for the duration of the festive season or regularly changed to reflect any promotional offers you have running. This idea can be used on your website, social media accounts, online stores, in-store, in email marketing campaigns, in online and print ads, in your mobile app, and in any holiday/Christmas cards you send out. The general rule for content marketing – be it blog posts or social media posts – is that 80% of your content should add value to your customers lives, and only 20% should be about promoting your business, services or products. Don’t feel guilty about bending this rule slightly over the holiday season, as long as you don’t end up only posting self-promotional updates. Your regular posts can still add value to the lives of your customers, while having more seasonal appeal: restaurants can share their chef’s favourite holiday-related recipe, beauty salons can post tips on how to extend the benefits of any treatments they offer when their clients are too busy to schedule an appointment, and gyms can share advice on how to stay fit and healthy while on holiday. As we approach the end of the year it is also the perfect time for sharing retrospectives, from styles that defined the year (fashion retailers), to top new tools (hardware stores), you’ll find there’s no shortage of light topics to write about over Christmas. 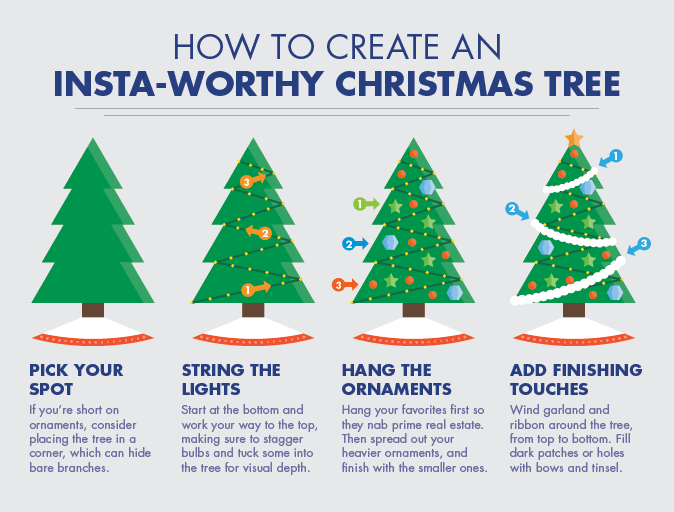 Over the holiday season, the blog for Bed, Bath & Beyond is filled with content to help you have a merry Christmas, without it ever being overly promotional – such as the above article giving tips on decorating your Christmas tree. This idea can be used on your website, social media accounts, in email marketing campaigns, and in your mobile app. Depending on your audience, you may find that your followers on social media are your most engaged customers and your best brand ambassadors. Why not thank them by having offers exclusive to social media platforms? Although digital coupons and coupon codes work best with online stores, brick-and-mortar businesses can still offer print-at-home coupons that are promoted exclusively on social media. An alternative for online businesses is to create a landing page with unique offers, and again only promote this on social media. While not limited to social media only, Furbish Studio’s Christmas offer did receive more attention on social media than on their website. This idea works best if limited to your social media accounts, and when linked to your online store. Christmas time is the ideal time to post short, relevant videos that help your customers – without being overly promotional. Identify items in your inventory that, due to their size or shape, could be difficult to wrap, and then film demonstrations on how to gift wrap them with ease. Keep the videos short – if you intend sharing on Twitter they should be no more than 140 seconds long, while Instagram’s limit is 60 seconds – so instead of trying to demonstrate multiple items in one video, shoot separate videos for each demonstration. Similarly, if you sell a lot of flat-pack items, you could publish videos that demonstrate how to easily assemble them. Hobby Lobby has previously shared videos on how to wrap gifts, but your audience might not have seen these, and you should still be able to find a way of making your own video quite unique. This idea can be used on your website, social media accounts, referenced in email marketing campaigns, and in your mobile app. The holiday season is a good time to boost your email marketing strategy, with a focused campaign to highlight specific products and offers and to share important information relevant to the season, such as extended trading hours, etc. A “12 Days of Christmas” campaign might seem cliched, but aside from being thematically fitting, it lends itself very well to time-limited offers, and the ability to create a sense of urgency. Alternatively, style it like an advent calendar. For smaller businesses, the emphasis should be on showcasing unique items that aren’t necessarily available from High Street stores and big box retailers, but it is perfectly fine to alternate between highlighting specific products and offering a general discount, either store-wide or department specific. But ensure that you have sufficient inventory of any stock being promoted. 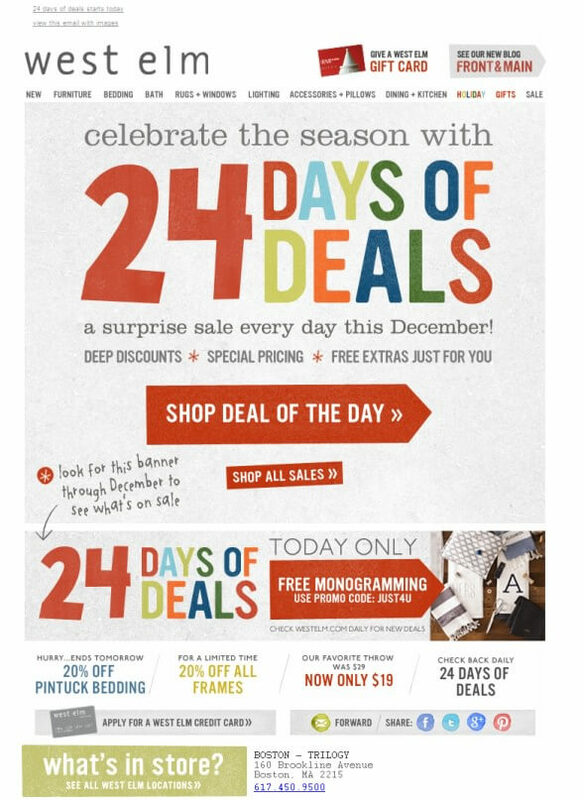 West Elm ran a 24 Days of Deals campaign a few years back, with daily deals, and free extras for email subscribers. This idea is suitable for any business with a well-maintained email database, and can easily be adapted to a print or social media campaign for businesses without an email list, including a print catalogue. If you’re worried about finding 12 different marketing offers, or about annoying your customers with daily email messages, scaling back to department-specific offers distributed weekly or biweekly can still be quite effective. Don’t choose departments randomly, but instead target those that will generate the most interest and traffic, and where you have sufficient inventory. If your inventory system makes it easy to identify top-selling items in each department, you can turn this into a “This Year’s Best Sellers” campaign, again assuming you have sufficient stock of each item. 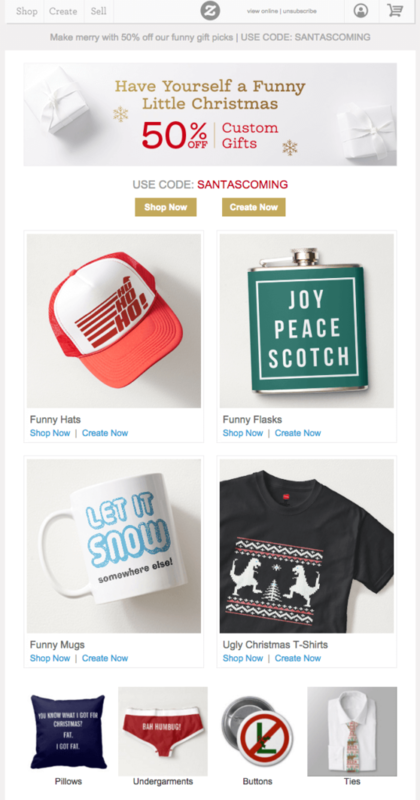 Although this email from Zazzle showcased their various product categories, it included a special discount code offering 50% off customised gifts. This idea is suitable for any business with a well-maintained email database, but can easily be adapted to a print or social media campaign for businesses without an email list, including a print catalogue. Yule adore our wrapping tips! Ho! Ho! Ho! Our Christmas Shop is Open. Merry? — We got you a ?! 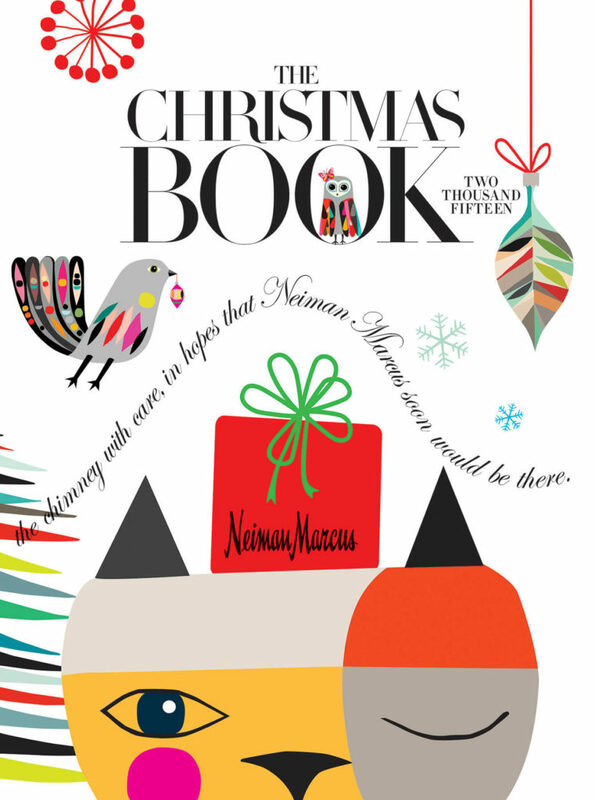 Our Holiday Gift Guide is here. reward first-time customers and your best customers. It isn’t too late to implement this ahead of Christmas, and if you are already enjoying the benefits of email automation, adapt the email messages that are sent out over the Christmas season. This idea is suitable for any business with a well-maintained email database and an online store. Boost your green credentials, while saving money, by replacing your print catalogue with a digital catalogue. Although a digital catalogue still requires professionals for the photography, layout and design – and the final file creation – you no longer need to budget extra for printing and distribution costs. Your digital catalogue can be distributed to your entire email database and made available on your website with links shared on social media. An added advantage of this distribution model is that you are now able to track how many people open your catalogue, and if you create trackable URLs for each link inside your catalogue, you will also be able to monitor how many sales your catalogue generated. Not small businesses by any measure, Neiman Marcus and Saks are, nonetheless, good examples to look at when considering a digital catalogue. Both retailers put out exquisite catalogues each holiday season, with Saks making it easy to shop online for items shown in their catalogue. This idea is suitable for any business with a well-maintained email database and website. Having an e-commerce site allows for more detailed tracking, but a digital catalogue is still suitable for businesses with no online store, and could even be incorporated into your mobile app. are designed to drive sales rather than awareness alone. For online ads you should ensure that they link to specially designed landing pages that make it easier for customers to quickly buy any product being advertised; and don’t forget that this is an ideal time to promote gift idea’s, either as standalone products or in themed collections. This idea is suitable for any business with a website, even those without an online store, and can be adapted for AdWords and social media advertising. Your Christmas advertising should not replace your regular advertising, but the bulk of your advertising budget should be allocated to Christmas specific ads over this period. The easiest way to do this is by creating a completely separate campaign just for Christmas, making it easier for you to allocate specific budgets to a predefined period, with your regular advertising operating in tandem, and continuing as normal as soon as the Christmas period is over. This makes it easier to target specific keywords and even to adjust your audience so that the ads are seen by people it is most relevant to. Google AdWords include the option for a countdown in your ad, and Christmas is the ideal time to incorporate this in many of your ads. Use the countdown for any ads promoting a special time-limited offer, discount or sale, and especially if you are offering free shipping for a limited period. 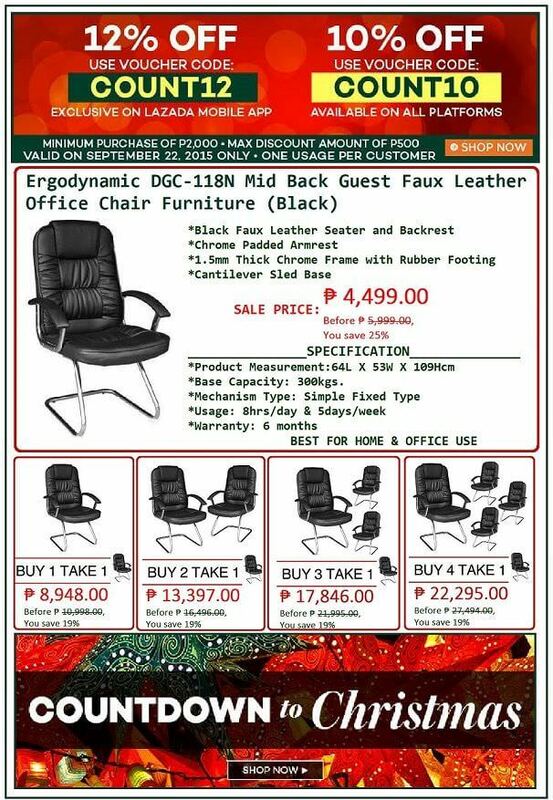 For online stores, there is always a “last day” for Christmas shopping, after which you cannot guarantee that any orders will be delivered before Christmas Eve. In addition to mentioning this throughout your online store, you should consider running countdown ads that highlight this date, and show how many days are left in which to place orders. Again, this idea is suitable for any business with a website, even those without an online store, but is more specific to the use of AdWords. Even if you’re not too familiar with remarketing, you’ve certainly seen it in action: search Amazon for any item you’re interested in, and until you search for something else, every time you visit Amazon you will see that product – and related items – being recommended to you. You might even receive a series of email messages from Amazon highlighting deals on that product, even if you never placed it in your cart. But remarketing is not limited to Amazon, and certainly not only available to large retailers. Any online store can use AdWords for remarketing, and it can be quite useful over this period, with the ability to extend its reach further if you link it to email addresses you have collected. This idea is only suited for online use and businesses with a website and/or social media presence. We haven’t (thankfully) progressed to being able to remarket in offline situations. If your business has a mobile app then you’re already aware of the many benefits it offers you and your customers. Why not reward those customers by distributing exclusive offers and coupons via the app? Distribution and management of these coupons and offers is considerably easier for you, and it serves as an incentive for your customers to keep using your app. Not forgetting that they don’t need to remember to print out anything to present when paying. Lazada, operating in various territories throughout Asia frequently offers users of their mobile app additional discounts not available on other platforms. This idea is obviously only suited to businesses with their own mobile app, and in particular to businesses that are unsuited to running large, diverse marketing campaigns over Christmas: restaurants, bars, hair, nail & beauty salons, etc. Improper use of push notifications in an app can easily annoy users, leading them to turn notifications off or even delete your app entirely. Assuming you aren’t guilty of this, the Christmas season is a good time to send push notifications to your users – in moderation. In addition to using this system to send out exclusive offers and coupons, you can use it to notify your customers of any special operating hours, along with any other information relevant to the holiday season. Just remember to exercise restraint, especially if you’ve never sent push notification to users before; you want to update your customers without irritating them. This idea is obviously only suited to businesses with their own mobile app. Another feature of your mobile app that you might not have made use of before is location based targeting, allowing you to alert customers of special offers, etc. only when they are within a specific geographic location. For this to be effective, the location you define should not be too broad: within a 100-200 metre radius of your business, rather than the entire neighbourhood or town. Additionally, since these notifications are only seen by customers when they are in close proximity to your business, the offers should always be current – don’t use this feature to highlight upcoming offers and events. This idea is best suited to businesses with their own mobile app, though it can be used too with paid social media advertising. Christmas is a time of giving: we give gifts to family, friends, and even work colleagues. As a business, you’re also giving something to your customers in the form of discounts, special offers and other incentives and rewards. But what about your local community, outside of your customers? Large businesses often have an ongoing social initiative which benefits specific charities or causes, and it is difficult for small businesses to match this. Except at Christmas. Identify a cause or local charity whose values and mission align with your own, and with those of your primary audience; then meet with them to identify ways in which you could help them. You could host a food drive, donate a percentage of all sales during a specific period to them (and ask your customers to try match this), or even organise a toy or clothing drive. When promoting such events focus more on the cause, or the work being done by the charity; although all material can include your branding and some details of your involvement, it is not an opportunity for you to cheer “Look at the good work we’re doing”. You want to gracefully show that you support local initiatives while encouraging your customers to also become involved, and tactfully including some brand awareness. 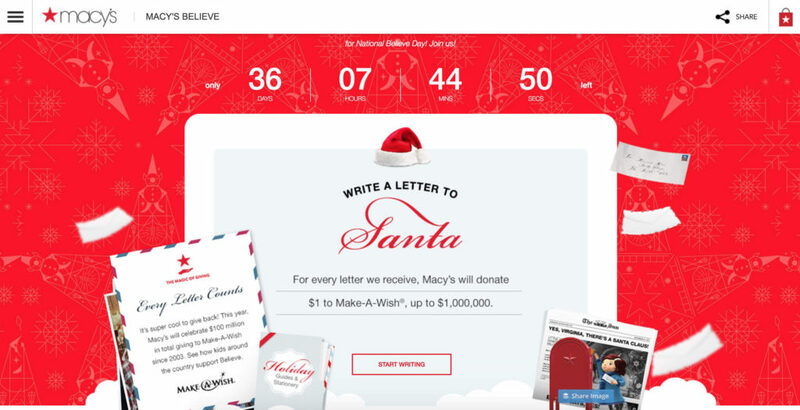 Macy’s has worked with the Make-A-Wish foundation for more than 10-years, using both a letter writing campaign and a Twitter hashtag to raise funds each Christmas, while Discount Retail Store Services in Las Vegas run an annual Christmas Gift Bag drive for the needy, asking the local community to participate by making donations in the form of non-perishables, clothing and toys. This idea can be used by any business – big or small – regardless of whether they are purely an online business or a brick-and-mortar business. Although being boastful of your charitable work is somewhat tasteless, there is nothing wrong with drawing a little bit of attention to some of your work. Hosting a Christmas breakfast or lunch for a local retirement centre or children’s home can easily attract the attention of the local media, giving your business free publicity, while at the same time bringing a bit of seasonal joy to those in need. You could even approach other small businesses to provide gifts, turning this into more of a community project that benefits more than just your own business. Again this idea can be used by any business – big or small – regardless of whether they are purely an online business or a brick-and-mortar business. Relax, nobody is expecting you to work with a direct competitor, but rather a small business whose product or services complement your own: think stand-alone hair salons and nail salons, furniture retailers and home decor stores, and even fashion boutiques and laundromats/dry-cleaners. The idea is for these complementary businesses to offer bundled deals which effectively promote each other, and encourage customers to support both. By way of example, hair salons and nail salons can offer gift bundles over Christmas which include treatments at both establishments. This idea is better suited to small businesses who offer complementary products, and are located close to each other. It can be adapted for online retailers too. Small Business Saturday is an initiative that first began in the US, but is slowly being adopted in other countries around the world, with 2016 being the fourth year it is observed in the UK. The initiative aims not only to promote small businesses, but also to encourage customers to “shop local”, and customers spent £717 with small businesses on Small Business Saturday in 2016. Engage with other small businesses and your local authority to find out what is being planned, and how you can become involved. Your local campaign organisers will not only provide some marketing material, but also valuable advice on how to attract customers on this day – 26 November in the US, and 3 December in the UK. This idea is suited to all small businesses, from family businesses, through to online stores, small wholesalers and even small manufacturers, especially those that find it difficult to stand out on Black Friday. As suggested by the charity drive idea, it’s great to get your customers involved in some of your events, and if you’re not yet ready to host a charity drive, you can still get your customers involved through a contest. More specifically, a contest that requires them to do more than just spend a certain amount with your business: ask your customers to submit photos of themselves wearing an ugly Christmas sweater, or a video of them singing Christmas carols – with a prize for best and worst vocalist, and you may even consider asking them to update the lyrics of a classic carol, incorporating current affairs and the way society has changed since the carol first became popular. All entries should be posted on your social media channels, and although you can link these contests to instore purchases, this idea is more about generating publicity and having fun. 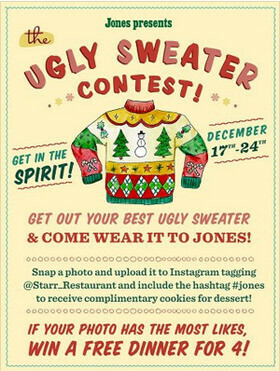 Jones restaurant used a combination of a contest, Instagram, instant rewards and a grand prize to not only drive sales over Christmas but also generate a bit of free publicity. This idea is suitable for most businesses, from retailers through to service providers, with either an online or physical store, and an active and engaged social media audience. The internet and related technology have made it considerably easier to distribute holiday cards to your customers, from Halloween through to Thanksgiving (for US businesses) and Christmas, but this has also made this gesture a lot less personal. Depending on how much personal information you collect from customers, consider making holiday cards personal again by having them printed and sent out via the postal system. And unless you are sending out hundreds of cards, you can take this a step further by writing the customer’s name on the card, possibly with a short personalised note. This does require a little more forward planning and effort, but it is a strong reminder to your customers that you see them as more than just a database entry. Sipsmith Gin sent out personalised, hand-written cards to their clients, with some so appreciative of the gesture that they had to Tweet about it. This idea is suitable for any business with an up-to-date customer database, with some adjustment depending on the size. It lends itself more easily to businesses with an online store, or a CRM system. Regardless of whether you send out digital or printed holiday cards, including a small gift – such as an exclusive discount – is an awesome way to remind your customers that you appreciate their support while encouraging them to continue supporting you. And if you are able to personalise this gift by linking it to the products they each buy most often, even better. Salt Publishing not only sent cards to their clients/reviewers, they also included a gift they knew their clients would find useful. Since this idea is linked to the previous one, it again depends on your business having an up-to-date customer database, though it can be applied even when you only have an email address for each customer, or engage with your customers via your mobile app. Online stores should already be incorporating a recommendation system in their e-commerce platform, highlighting products related to what customers add to their carts, and during Christmas, this can be adjusted slightly to include gift wrap, gift tags, and smaller items as gift suggestions. Physical stores can adapt this by placing gift wrap and appropriate impulse buys close to all pay points. Depending on your type of business you may already have impulse buys at all pay points, but make sure these are more suited to the holiday season, rather than just generic impulse items. This suggestion can be followed by any store, both physical and online, selling physical products rather than services. No matter how well your customers plan their holiday shopping, they are likely to have at least one person who is difficult to shop for, or whose gift idea is no longer available. Help these customers – and your business – out by ensuring you have gift cards available for purchase. Gift cards for use in your business. If you have switched from selling physical gift cards to providing digital cards, ensure you have prominent signage indicating this, and that you at least provide some physical representation of the gift card. Although Uptown E Store’s Tweet promoting their gift cards covers a variety occasions, it does include mention of Christmas – which is important at this time of the year. Gift cards can be offered by businesses selling physical products and/or services, including online-only businesses. It is quite easy for customers to feel a little overwhelmed when doing their Christmas shopping, and you can alleviate this by promoting gift sets and “curated” gift ideas throughout your store, both physical and online. Hair, nail and beauty salons can promote treatment packs, while liquor retailers could put together a selection of craft beers, single malt Scotch, or a range of artisanal liquors. Ensure your gift sets and gift ideas cover a broad range of interests and ages, and if you have put out a Christmas catalogue, it should definitely include sections for gift sets and gift ideas. Gift sets and gift ideas can be promoted by most business types, and should definitely be incorporated into any online stores with a large enough assortment of categories and products. Finally, you don’t want to neglect creating the right atmosphere for this time of the year. While our first point covered adding Christmas flair to your branding, this point is about incorporating Christmas flair into your business as a whole. We’re not suggesting anything that resembles a wedding reception for Liberace and Elizabeth Taylor, but some seasonal decor will seldom look out of place. At the very least consider providing a gift wrapping service, or offering your customers a mug of hot chocolate, or other seasonal drink on entering your business. 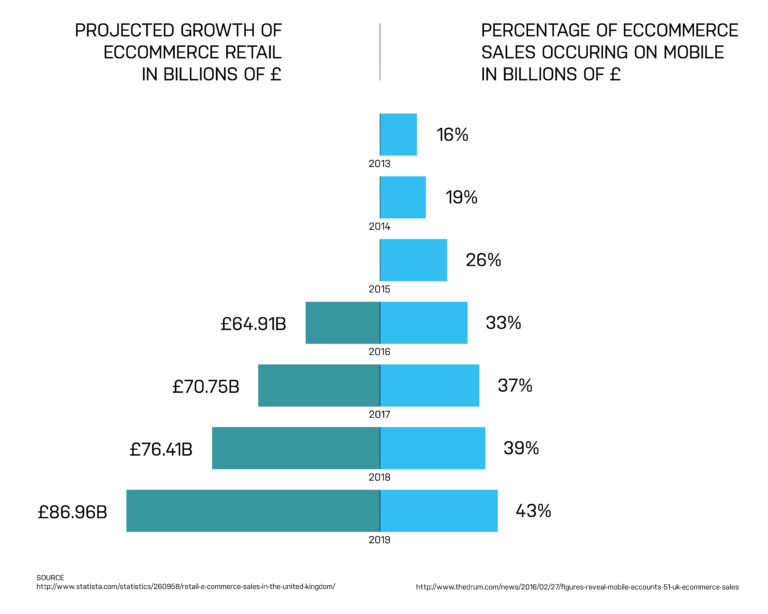 Naturally what you do depends on both your budget, and what would be appropriate to the bulk of your audience. Just ensure you have a plan to remove it all once the holiday is over. 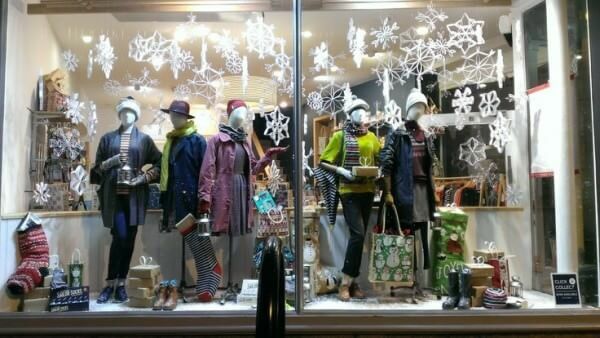 Seasalt have a tradition of tasteful Christmas displays and decor centred around a theme, and still true to the brand. They not only share images of these every year on their blog but even show the decor being made. Last year’s post included a video demonstrating how you could make your own snowflakes similar to those on display. Most of the ideas listed above can be adapted to work for different business types, and on different marketing channels, and if you don’t already have an online store or mobile app, perhaps you will make those part of your 2017 New Year’s resolution, so that come Christmas 2017 you are able to market to an audience outside of your physical location, using any of the ideas on this list that you weren’t able to implement this year.